Oh hello. Do you see the “bird seed” above? 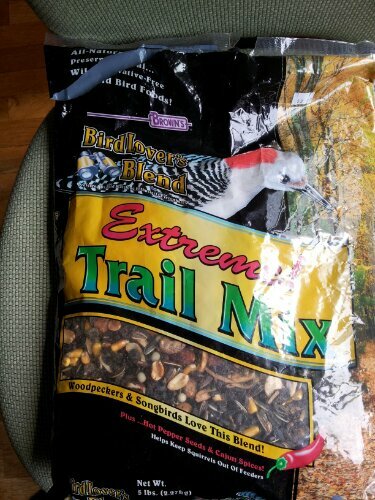 Well, I purchased this seed, which said it’s got hot pepper and Cajun spices that squirrels don’t like so that all I’d get in my yard are, you know, birds. Well, I’m convinced that a pack of Squirrels (possibly a gang), migrated from Nawlins and began to repackage squirrel food as bird seed with spices. Can’t you just hear them? “Oh yeah, dis gonna go fly off da shelves and inta the mouds of our fellow Gray Furries”. Jerks! I can’t tell you how many squirrels were in my yard. And they’re lucky that I like them!! I find them charming and funny, the little asses. So here’s what I did. I went to a better store and bought safflower seeds for the cardinals and finch food for the sparrows and refilled my feeders. Then I dumped a copious amount of the “bird” food across the yard and there was a major feast the second I walked back into my house. Spread the word – these squirrels are smart! ← Someone Is Dying In The Road…Let’s Take a Pic and Tweet It!